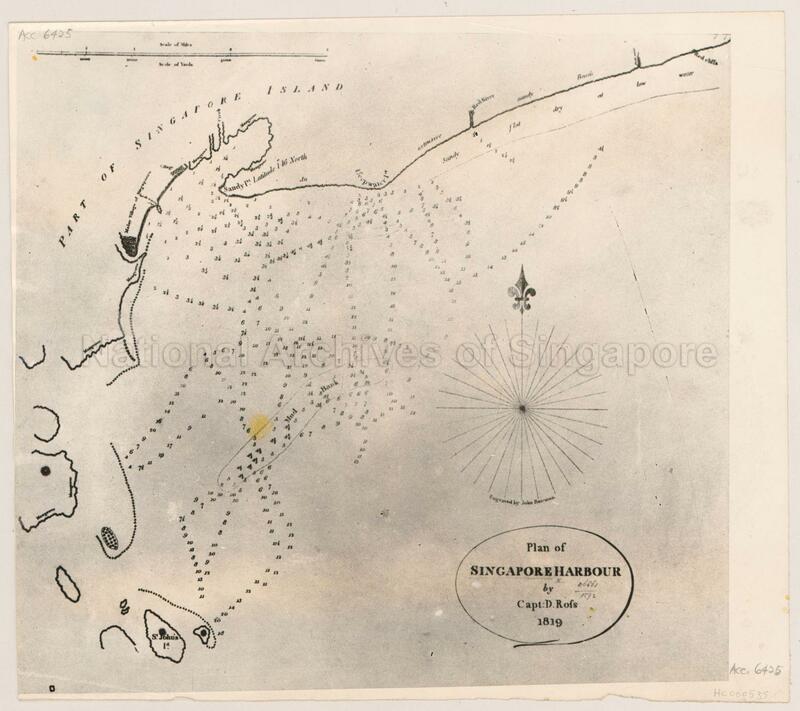 Plan Of Singapore Harbour By Captain D. Ross (Rofs) Plan shows part of Singapore Island, mangroves, Malay village, sandy beach, red river, red cliffs, mud bank, Saint John's Island, and others. A map of many cartographic first: -	the first large-scale map of Singapore -	the first map to show Malay villages and settlements on the island -	the first map reflecting "Singapore" as it is spelled today This map shows the harbour and adjacent coast of the Singapore Island, including a few offshore islands, such as the St. John's Island, at the time of Stamford Raffles' first landing on Singapore. Captain Daniel Ross, the hydrographer of the East India Company (EIC) who accompanied Raffles and William Farquhar to Singapore, prepared the map while Raffles was negotiating with the Temenggong to establish a trading post. In a letter he wrote to Singapore's First Resident, Maj. William Farquhar, dated 25 June 1819, Raffles outlined his plans for the development of Singapore town along the Singapore River, giving priority to improving port facilities for ships to dock and unload, and allocating land for the various communities of settlers to form the European, Chinese and Malay Towns.